When it comes to evaluating a Staging Course, you have questions about what you will receive during the course. But what happens AFTER you graduate? If you are like most people, that question is as important if not MORE important than what is in the course content. At Stagedhomes.com one of our core mandates is: "We provide you with the tools for success and we are a resource for you after you graduate." We want our students to thrive long term not struggle to figure out how to succeed. We consider ourselves a FAMILY and we support one another long term for maximum growth and success. When you graduate from a Stagedhomes.com Course, you are part of that family with a company behind you and colleagues all over the world that are now excited to share in your growth and success. 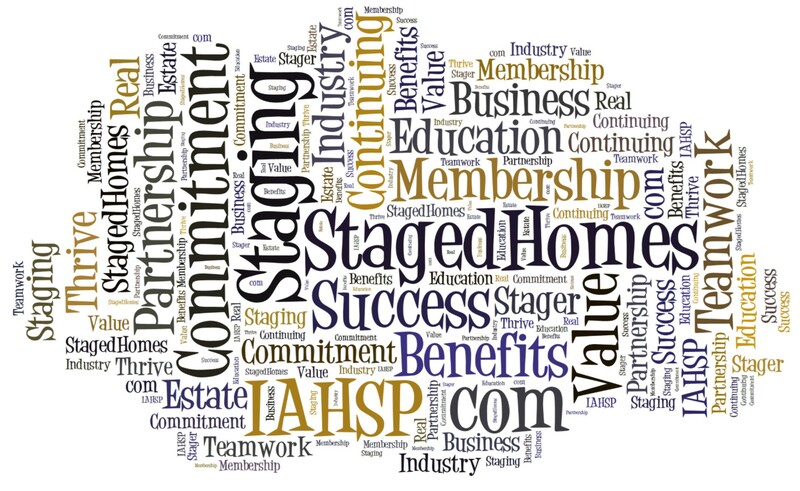 Each year for a nominal fee you are asked to renew your membership affiliation as an Accredited Staging Professional® Real Estate Agent or Stager and member of the International Association of Home Staging Professionals® (IAHSP®). Below is a list of all the valuable benefits you receive when you continue in your membership with our Designation and preferred industry Association. The Staging University - This is a private part of the Stagedhomes.com site only accessible by our ASP Members. Full of Marketing & Business tools and forms to help you succeed. Other companies and associations charge for resources we provide complimentary to our members saving you hundreds if not thousands of dollars over time. Your Short Bio for leads and exposure to the public - You have the ability to build and profile that the public can search and find for leads that go directly to you. We even track the number of views you have received so you know you are being found on the Stagedhomes.com site. Feature Page/Website for Stagers - Stagers graduate with a website tool Feature Page that you can customize and update freely as many times as you want as part of your membership. Ability to Load Properties for additional Exposure - Both Realtors and Stagers have the ability to load properties they have listed or Staged for sale onto the Staged Properties Portal that is viewed and searched by both Buyers and Buyer's Agents when looking for properties to purchase. Online Portfolio of Your Successes - Your uploaded Properties that SELL represent an ongoing portfolio of your work and successes. As long as your membership is current, these ongoing representations of your successes remain. Ongoing Education - FAST Track Sessions now included with your renewal - You have the ability to attend these power-hour webinar sessions at your leisure and ADD to your success and knowledge as an ASP. Discounted rate for New Industry Designations taught live and via Webinar - New Designations on key industry topics are offered to our members at a lower price than those who are not members. IAHSP Regional Chapters - You have the ability to join your local IAHSP Chapter for ongoing networking and support, or tap in remotely via webinar or conference call. We want all of our members to be able to receive vital and timely industry information and advice from experts in the industry. IAHSP Annual Conference & EXPO - Our annual Conference & EXPO has been touted as the best and most educational industry conference. Since 2003 we have been hosting quality, educational, and fun events for the Home Staging Industry. IAHSP Regional Conferences - IAHSP Regional Directors have coordinated one day info packed events that bridge the gap between one annual conference to the next. Key Vendor Relationships - As your business grows, you need to partner with companies that provide Services and Products you need. We have established special pricing and discounts with business and product vendors that will help you save money and provide you access to resources you need. Stagedhomes.com Staff and Trainers dedicated to helping you - Our talented and dedicated team is available before, during and after you attend your course. You are able to call and email our team members for help on a variety of topics, or just to be encouraged in your journey. Social Media sites with valuable colleague interactions - You are able to join in the conversation on various private and public social media sites where interaction among industry colleagues provides valuable insight on a variety of topics. The StagedHomes.com website is designed by Barb Schwarz and Duane Leem.